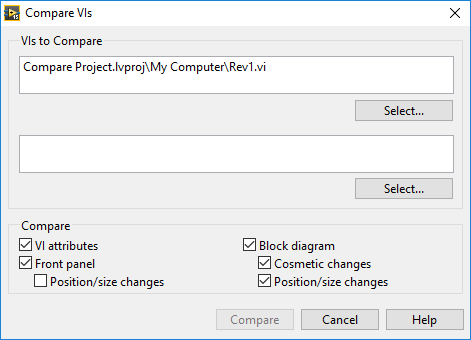 There is a function in LabVIEW that allows the user to compare two VIs to check for any differences. This is very helpful for routing any issues that may occur when you change a working VI to add or adapt functionality. One note to make is that two individual VIs are required to do the comparison. The above window appears with the opened VI added to the first compare dialogue box. By selecting the “Select” button you can search through the project file to find which VIs you wish to compare. You can also select which features you wish to compare such as Cosmetic Changes and Position/Size Changes. Select the “Compare” button to start the compare process. 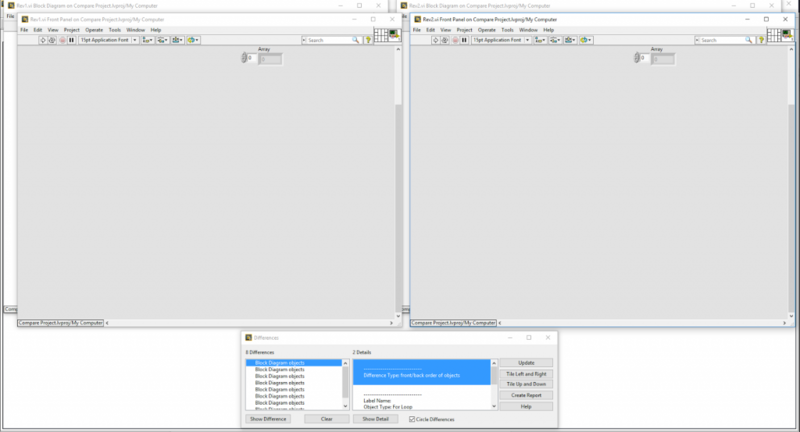 Once LabVIEW has found all the differences, the following window configuration will appear. The two compared VIs will appear tiled and the Differences window will appear at the bottom. The Differences list shows each difference between the two VIs. By double clicking on each difference, the two VIs will highlight (usually with a red circle) the current difference as well as list the details of the difference. The Differences window can be left open while changes are made to one or both of the opened VIs, if you wish to see any updated differences then simply select the “Update” button. There is also a “Report” button which generates a detailed report of the differences for the two VIs in a web page format. This can be particularly useful if a code review is required between two iterations of code.